RUSH: Here’s Adam in Albany. Great to have you on the EIB Network. Hello. CALLER: Hi, Rush. Thanks for taking my call. I’m actually in Utica, New York, believe it or not. RUSH: Utica! That’s great. Well, you’re in New York, and as long as you’re there, it don’t really matter where there is, right? RUSH: Because you’re actually here with us and that’s what counts. RUSH: Have at it. Just have at it. When it gets boring, I’ll tell you. CALLER: I have a unique perspective as far as a solution, but the first thing I want to tell you is when I was in tenth grade in high school we had a bunch of kids that were all black and chanted the word “MELT.” And they said “MELT day” was coming on March 3rd, which was a “MELTing” point. And it got picked up by the newspapers and the media. The school was not shut down, it just said there was gonna be a mass shooting and MELT: Murder Every Living Thing. So my parents kept me home and over 900 kids stayed home from school that day. The school did not shut down, nothing happened. However one year later, Columbine happened. I was in eleventh grade when the first school shooting happened. I’ve been seeing these things now for the last 15, 20 years continuing to happen. All the liberals want to go on the offensive. “We gotta ban guns! We gotta get rid of guns.” The time for banning guns is bye-bye. You should have done that 30 years ago. The guns are out there, and it doesn’t take Nostradamus to tell you the next school shooting is gonna happen again, and the person that’s gonna do it already owns the firearm they’re going to use. My suggestion and solution is not to go on the offensive, go on the defensive. Defensive wins championships. Tom Brady, the best offensive weapon in football history, 500 yards passing, three touchdowns? He lost because of defense. Okay. 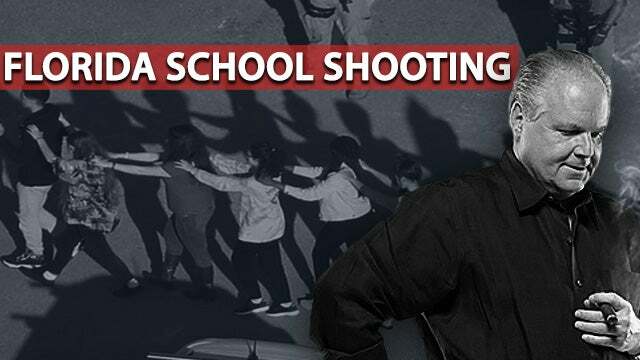 We have to assume the shootings are going to continue to happen, and we have to protect the students and the schools. I’m thinking, “Yes, we have.” I grew up being told how to hide under a desk if the Soviets launched a nuclear missile at us! We had a whole generation of people grow up in school worried, scared to death that a nuclear bomb was gonna hit. The idea that kids have never grown up with fear is absurd. Things that are happening today are not unique. It’s not that something today happening is unprecedented. There’s always been fear, it’s always part of life. If it’s not a nuclear bomb hitting, it’s fire. You think these kids aren’t scared to death of global warming? I got another thing for you. They literally think the earth is gonna be uninhabitable in another 20, to 40 years, 50 years. They’ve really been made to believe this. They’re scared to death about all kinds of things. 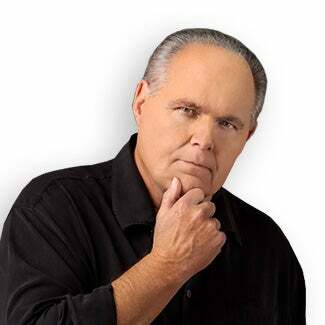 RUSH: But your point about going on defense, I love your point that the next school shooting or mass shooting, the gun that’s gonna be used is already in the hands of the perp. That is a pretty astute observation, and I was watching CNN moments ago and Anderson Cooper, you know it’s serious when Cooper doesn’t put on the coat and tie. When he’s wearing the T-shirt and the jeans, you know it’s emergency, he didn’t have time to really deck out as a TV performer, as a TV host. And the graphic: “Trump did not mention guns in his comments to nation.” I said, “So what? What the hell does that matter, Trump didn’t mention guns?” So the focus is totally on the guns, and you’re right, even if we outlaw the purchase of guns today forward, it’s not gonna stop anything. The time to have done it was years ago, and it was never gonna happen. But it’s not the problem. That’s why it won’t work. RUSH: You think we could prepare these schools in a defensive way, like the ideas you had, bulletproof glass and perhaps armed guards, armed teachers, this kind of thing? CALLER: Armed teachers. When was the last time you heard a mass shooting at a police station? No one’s going into a school if you’ve got a school full of Steven Segals. RUSH: Right. There’s no crime in a police station. That’s absolutely true. People don’t hold up the cops. But teachers, I can’t imagine — well, some of ’em probably wouldn’t mind, but a lot of teachers wouldn’t want the responsibility of being armed. CALLER: This last gym teacher, he just shielded a student and died. In Sandy Hook a teacher shielded students and she died. So they’re willing to put their lives in front of the bullets with no defense, I’m pretty sure the right teachers would want to arm themselves. And I’m saying properly train them, have instructors come to the school to train the teachers, prepare them. They conceal the weapons when they’re working, and then they would return it into a lockbox at the end of the day. RUSH: Let me just, the left is never gonna go for this, and the reason they won’t go for it is because adopting your idea of defensive, preventative measures has, as part of its acceptance and conclusion, that we’re not getting rid of the guns. And that’s all they want to talk about. So if we’re gonna come up with ways to stop this or limit the damage by having armed guards, bulletproof glass, armed teachers, whatever other provisions, the left is gonna say, “You can’t do that because you’re acknowledging the guns are not gonna be changed. Guns are gonna still be used.” Yep, that’s right. They’re never gonna go for it. CALLER: How many deaths a year are by guns? A little over 30,000. Do the listeners know that of those 30,000 over 20,000 are suicides? I mean, you’re talking about less than 10,000 deaths a year. The flu kills more people. You watch a news network, you think everybody’s dying from guns. That’s fake. RUSH: Adam, I tell ’em every year, if you really want to save lives, ban the wheel. CALLER: Or doctors. Or doctors in the ER. CALLER: You know they say infection kills 200,000 people a year in the ER. RUSH: Yeah. That’s an odds thing. But, I mean, the wheel, which is used predominantly, the automobile kills more people every year than guns. Never talk about banning cars. Only internal combustion engine cars. Anyway, Adam, it was quite interesting. I’m glad you called. RUSH: Steve in Milton, Delaware. Great to have you. How you doing? CALLER: I’m doing well, Rush. It’s an honor. CALLER: Thank you for being America’s rock. I really appreciate it. CALLER: So basically I have an idea, and I agree with the last caller in that defense is our biggest strategy here. But the problem is funding. I mean, we already spend so much as a percentage of the state budget towards education. The fact is we aren’t getting our dollars’ worth out of it. Kids are mandatorily sent to these schools where they’re unsafe. That in and of itself is wrong. It shouldn’t be that way, especially considering the fact that in the United States there are several Supreme Court cases where the police are not liable for a citizen’s safety. The police have no liability to protect you. You cannot sue the police in a hostage situation for failing to protect you. RUSH: Yeah, I know. That’s the rub here. CALLER: And the thing is, what’s so jacked up about that is that the left is trying to take away our sole means of protecting ourselves when in fact we are the only ones responsible for protecting ourselves. So that, to me, it can’t sit on its own face. So that is what it is. RUSH: You know, that is the ultimate defensive proposal. Just don’t go to school. Get your degree at home with accredited online courses. I’m telling you, folks, it’s time for innovation. RUSH: Now, here is the memory on defending against shooters. I remember the story we had here, and it was a few years ago, that some school was telling its students — and you’ll remember this when I mention this. A school — I thought it was in Alabama — was telling students to bring in cans of food that they could throw at a shooter if the shooter got into their classroom. Is this ringing a bell with any of you? The school was in Alabama. The story was reported in the New York Daily News back in January of 2015. In fact, it was January 13. “Alabama Middle School Principal Tells Kids to Bring Canned Goods to Class and Throw Them at Possible Gunmen.” That was the headline in the New York Daily News, and then from the middle of the article… We went back and researched this, folks. We keep everything. We have the most massive transcript archive of everything I’ve ever said here. It’s incredible. “An Alabama middle school asked students to bring canned goods to school so they can throw them at potential gunman. W.F. Burns Middle School in Valley, Alabama, Principal Priscella Holley sent a note home to parents … asking them to send their students back to class with an eight-ounce can of beans, corn, soup or any other food,” and there was more to the story. Priscella Holley also said, “The canned food item could stun the intruder or even knock him out until police arrive. The canned good item will give the students a sense of empowerment to protect themselves and will make them feel secure in case an intruder enters the classroom.” This really happened. So you’ll see that there have already been innovative ideas (laughing)suggested here. I knew I remembered this. It was vague memory. I didn’t mention it because I couldn’t specifically remember the place or the date. But it was three years ago now. Canned goods. Students were asked to bring in — by the principal — canned goods to throw them at a potential gunman who might get in the classroom. And I don’t… Follow up. I don’t know. I don’t know if it ever happened. I don’t remember anything beyond the original story. That’s what we had here in our archive. RUSH: Paul in Louisville, I wanted to get you on here, we had time. How are you doing, sir? CALLER: I believe that if we want to reduce violence in our society, we’re gonna have to start teaching morality again. CALLER: And it starts in our home with our parents. But it shouldn’t stop there. It should be in our schools too. RUSH: You know what the problem is with this, Paul? RUSH: You’re not allowed to define it anymore. The American left, the Democrat Party will not allow you to define morality, particularly if it infringes on their good time. And if it involves you judging them, ain’t gonna happen. Not only are you not gonna judge ’em, you’re gonna support whatever they want to do, and you’re gonna love them doing it! No matter how much it violates your morality. But I agree with you in principle. It’s the one thing missing. Something else I’m wondering. Why isn’t the left offering to use their favorite weapon in things like this, diplomacy? Why aren’t we talking? We talked to Kim Jong-un, and we make a heroine out of his sister. Where’s the diplomacy? Where are the diplomats?